Another great reader submitted Mac setup here: this one is a decked out Mac Mini Server Quad i7 with 8GB RAM and dual 7200 RPM 500GB hard drives, connected to dual monitors, and to the right is an iPad 2 64GB model. 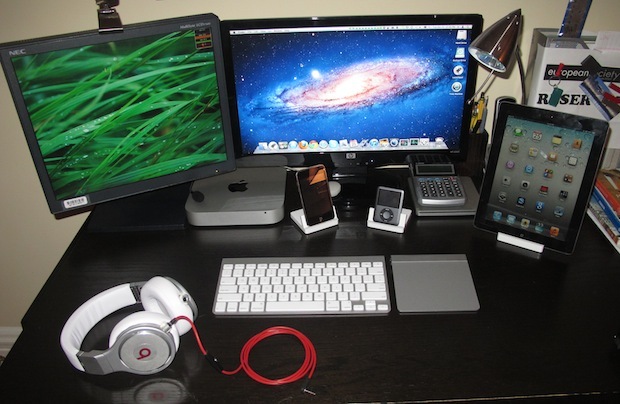 Rounding out the desk is an iPod touch, iPod nano, MacBook Air superdrive, Beats Pro headphones, and an Apple wireless keyboard and trackpad. How do you hook up two monitors to a Mac Mini with only one port? So, what exactly, is this person’s purpose? He just wants to show off how he spent money. It’s not about showing off, they’re just fun to look at. You’re welcome to submit your own. Excuse me this is my setup, and I feel you should take your ranting somewhere else, cause the place for that is NOT in these comments. How would you feel if I went up to you and said that your life’s work was useless, well listen up bud if you have something useful to say, then by all means say it, but if you go around the internet ranting on people then you’re the idiot! P.S. I am a statistician and have majored in computer science, I NEED THIS COMPUTER. P.S.S If you have still not understood my above explanation of why you shouldn’t rant on my setup then go rethink moral philosophy. “Frakkin’ Idiot”? You ake a quantum leap assumption about somebody you don’t even know and you call him an idiot? In fairness, anyone who buys Beats headphones does have a bit of idiocy in them. I want to know where did you get all the money for such a sweet setup? Let us in on your secret…lol. I like the little fat Ipod Nano, I miss those. Thanks I’ve been trying to figure out a good way to hookup two monitors to my mac mini. The HP S2031 supports up to 1600×900 resolution, you should be able to access that resolution through System Preferences > Displays. You shouldn’t need any drivers, although some movies that aren’t wide screen may need to be zoomed in or their resolution increased to fill the screen within VLC. Thats where you access resolutions on a mac. As I said, when choosing 1600×900, the entire screen is aspect-ratio distorted so everything is squeezed. I used the VLC application as a demonstration of what is happening with the entire screen output.